Remote monitoring – a key element of mHealth, where mobile solutions are used to deliver health – is becoming ubiquitous in the U.S. population. Some 60 percent of U.S. adults track their weight, diet, or exercise routine, and a recent Gartner forecast predicted that the overall wearable market would expand from 275 million devices in 2016 to 323 million devices in 2017. In addition to this type of tracking and education about preventive health care, mHealth is also used for chronic disease management, treatment support, and disease surveillance. Remote patient monitoring (RPM) uses digital technologies to collect medical and other forms of health data from individuals in one location and electronically transmit that information securely to health care providers in a different location for assessment and recommendations. This approach is already providing value to patients and their families, as well as to providers, enabling remote monitoring of blood pressure, glucose, weight management, medication compliance and pulse oximetry. 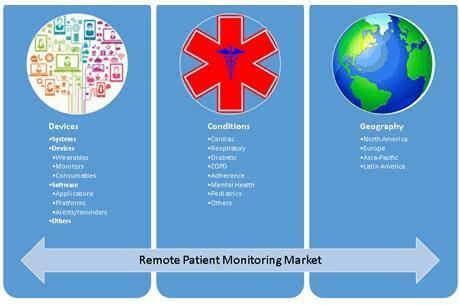 The remote patient monitoring market currently covers a wide range of conditions and geographies (Figure 1). There is increasing evidence of the benefits of RPM. One example involves improving asthma disease management, adherence and control. In a study, 299 patients with asthma in Louisville, KY, were enrolled in a non-randomized pilot study. Participants received an electronic inhaler sensor to track the date, time and GPS location of rescue medication use. After a 30-day control period, participants received 12 months of access to smartphone and web-based applications that provided visualizations of their data, personalized education and support based on national guidelines. At study exit, rescue inhaler use declined by 75 percent, and the proportion of participants with an asthma-free day increased significantly by 39 percent. In the clinical trials space, RPM technology has the potential to enhance study design, streamline the enrollment process, and increase patient engagement. To fulfill this potential, the technology must be designed to meet the needs of both patients and clinical trial sites by being user friendly, quick, enticing, readable, portable, Institutional Review Board compliant and secure. 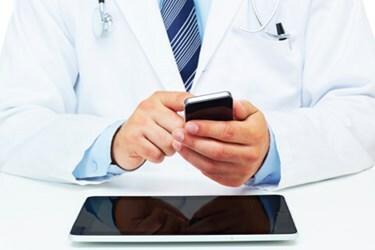 Mobile platforms should be designed to adapt to the busy workflow of an outpatient practice, take advantage of ‘downtime’ during the patient visit, enable enrollment while the patient is a ‘captive audience’ at the site, and enable direct, paperless entry. Platforms should offer ‘one-stop shopping’ for screening, consent, patient and provider surveys, and coordinator data entry. One example of the use of a mobile platform is in the ongoing Virtual Exercise Rehabilitation In-home Therapy: A Randomized Study (VERITAS). This is a multicenter randomized clinical trial aimed at evaluating the costs and clinical effectiveness of technology-supported home-based physical therapy (PT) compared with traditional PT in the home or clinic. Patients in both groups are prescribed exercises by a physical therapist and this trial is focused on the delivery of the PT program either in the home with virtual PT support, or with PT provided through traditional methods (e.g., home health, clinic, printed instructions). This study is recruiting around six practice groups to enroll 300 patients with unilateral total knee replacement (TKR) who are planned to return home after hospital discharge. At present, some 80 patients are using remote monitoring across four sites in Durham, NC. A total of 30+ patients have successfully accomplished the goals of the study and been discharged from the system, and 30-35 patients are being recruited each month. 2. To explore whether individual patient characteristics are associated with differential improvement from six to 12 weeks assessed by patient-reported outcomes. Phases of implementation of this type of study include planning, testing, monitoring, and updates and adjustments as needed (Figure 2). Metrics are displayed on a dashboard, which provides continuous monitoring data, along with alerts that indicate anomalies to providers and monitors, such as patients who are not in compliance with their rehab routine and may require an intervention, in close to real time. A baseline is established for each patient, so that physical progress can be assessed, and an individualized exercise plan is developed via a Skype session before the surgery. Post-surgery, a follow-up Skype session enables the exercises to be tailored based on the patient’s status. The in-person Skype session helps develop patient engagement and build confidence in the level of support available if issues arise. An important question is how much data is needed, and how often. If too much or too little data is transmitted, this may not be actionable. Adjustments can be made as necessary as the study progresses. This determination will be specific to each user, project or study. Often, a layered approach is used, where the minimum amount of data is presented for decision-making, while additional layers of detail exist and can be mined if needed. In this and other studies, virtual interactions with providers have potential to provide value for patients in five key areas (Figure 3): passive reporting, longitudinal data, convenience, tracking and support. Passive reporting is a major benefit to patients, requiring minimal or no effort to remember, document, or transmit data to their providers. For providers, value accrues from the reduced number of patient visits, ability to monitor more patients, need for reduced staff time and numbers, better outcomes, and increased availability of data for informed decision-making. Experience with the VERITAS study indicates that when providing the device to patients, physical therapists and physicians alike, a consistent and appropriate on-boarding approach is helpful, including educational materials in the preferred format for each audience. Feedback should be sought and improvements made as necessary. Progress to date with the VERITAS study has been promising, with patient enrollment on track, and generally positive experiences for patients and investigators in adapting to the technology. Cost efficiencies are expected, with larger numbers of patients being monitored by physical therapists than would be possible with all in-person visits. In future, remote monitoring and data collection will likely be used in many more studies, also involving an initial baseline assessment of each patient, which can then be used to track any deviations indicating the need for an intervention. Vincent Miller is Project Coordinator at the Duke Clinical Research Institute (DCRI), the world’s largest academic research organization and a part of the Duke University School of Medicine. The DCRI conducts groundbreaking multinational clinical trials, manages major national patient registries, and performs landmark outcomes research.